I took this picture of the Sun with a small refractor and a solar filter earlier today. The giant sunspot group on the left has a dark core easily big enough to swallow the Earth. Astronomers have labelled it AR2192. At around 0500UT on Sunday AR2192 unleashed a powerful X-class flare. It wasn't Earth directed. The rotation of the Sun will carry AR2192 towards the solar meridian in a few days and any flares of that magnitude are very likely to create chances to see the aurora soon after that. For updates on aurora visible in the northeast- visit Spaceweather.com and look for the kP index increasing to 5 or more. Or follow NASTRO on Twitter (@Nastronomers). Or follow me on Twitter (@AdrianJannetta). Just back from a great public outreach session at Housesteads Roman Fort. The sky was beautiful and clear. The sky there seems BIG - with great visibility all the way to the horizon. The moon was out (waxing gibbous and bright) and that meant no Milky Way was visible. I bet that place is pitch black on a moonless night. Here are some of the people who came to our event this evening. The stars of the Plough are in the sky behind them. The second star from the end of the tail in The Plough - Mizar - is a double star. In times past it was known as the Horse and Rider - close inspection shows that Mizar has a faint companion. Appropriately enough the ability to resolve Mizar and Alcor may have constituted an eye test for Roman centurions, as it most certainly did for later Arabic fighters. There was a decent turn out from NASTRO members with telescopes. I took my 10" Dobsonian and showed people the moon, Mizar and Alcor (double star in the Plough), the E.T. Cluster (NGC457), the Great Hercules Cluster (M13) the Pleiades (M45) and the Ring Nebula (M57). Sunday evening. The clouds break as twilight falls. The brightest stars are visible. In the north, noctilucent clouds begin to shine. In the deepest part of the night the Milky Way is visible despite the lingering twilight. Six weeks after the solstice and it's becoming possible to do astronomy again. This is the view from my garden in Red Row, Northumberland. Light polluted and not completely dark. But so many stars! It's turning out to be another good season for noctilucent clouds! NLCs, for short, are the highest clouds on the atmosphere and are formed by water vapour condensing onto meteor smoke about 50 miles above the ground. They are a strictly summer phenomenon (end of May to start of August) and they only form near the poles of our planet. In Northumberland we are in a perfect position to see them each year. I've written a more detailed article about NLCs here. A history of observation and photos of NLC types can be seen here. 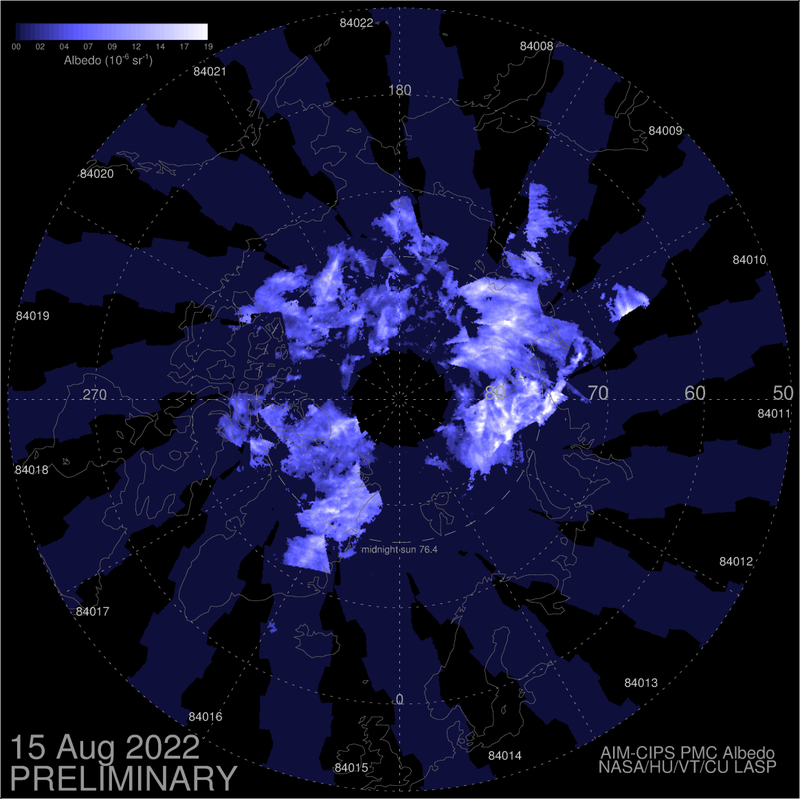 NASA produce an up-to-date image of NLC coverage - click here. A clear night doesn't guarantee seeing NLCs but it's always worth a look outside, about 90 minutes after sunset at this time of year. Look towards the northern horizon. You might mistake NLCs for cirrus clouds at first but the white or electric blue colour will grow brighter as the sky around them darkens. Here are some pictures I've taken in the last week or so. NLC season should last another 2-3 weeks but NLC appearances will soon begin to diminish as the upper atmosphere heats up again towards the end of summer. It's been quite a few weeks since I did a talk at NASTRO. Real life stuff and travelling to Malaysia and Singapore got in the way. The astronomy part of me never switches off though. Stamding at the top of Marina Bay Sands with the stunning vista of the Singapore skyline around me....I was the only idiot looking up at the sky for my first view of alpha Centauri and hoping the cloud in front of the Southern Cross would hurry up and shift. And all the while wishing they'd switch the bloody laser show off. They really haven't heard of light pollution in Singapore. Next Thursday (July 10th) I'm back at NASTRO and doing another part of my introduction to astronomy course. This time it's cosmology. Much of modern cosmology is entirely uncontroversial: that the universe has a finite age and that the Big Bang model accounts for the expansion, composition and structure we see today. Detailed analysis of the cosmological data suggests that much of the mass in the universe is in a form which doesn't shine or interact with normal matter (so-called dark matter) and that the universe expansion is actually accelerating, driven by a so-called dark energy whose origin and precise nature is not understood. A minority of scientists think the problems of not yet finding direct evidence of dark matter or having to introduce dark energy into cosmological equations can be resolved if we accept that gravity begins to behave differently on the largest scales imaginable. I hope to touch on all of these issues during the lecture on Thursday. Most people I've met want to know about why the universe looks the way it does. Maybe it's basic human curiosity to know that answer or a deeper need to understand one's place in the universe. Either way, we are all fortunate to be living in a golden age of cosmology where not only can we ask the big questions, but there is hope we can finally learn the answers. For the last couple of years, in every public astronomy event it seems like I've included the words "the observatory at Hauxley is currently undergoing maintenance". As of yesterday the 14 inch telescope is sitting on top of a newly installed EQ8 mount and preliminary checks indicated that it's working absolutely fine. This evening we put the telescope through its paces during an observing session. Jupiter and moons looked great with plenty of detail visible in the Jovian atmosphere. The supernova in M82 was seen fairly easily (now fainter than it was a week ago). Our guests got great views of the Orion Nebula and the four stars of the Trapezium at the heart of the nebula. On the left, it's the Orion Nebula: a 60 second exposure. The four stars of the Trapezium are resolved with no trailing. On the right is galaxy M82 and the supernova 2014J. That's a four minute exposure. The mount tracked for four minutes with no discernible trailing of the stars. The polar alignment needs a little bit of tweaking. The telescope doesn't put targets dead centre most of the time. But the hardest part seems to be over and we finally start getting people some great views of the sky again at Hauxley. A really great evening of astronomy under the dark skies of Ingram in north Northumberland last night. It rained most of the day but the forecast said a very a long clear spell was coming during the evening. The forecast was spot on! The highlight of the evening for me were showing people what a little telescope can do! I had the little 80mm Skywatcher refractor with me and the widefield views of the Pleiades and Orion Nebula were spectacular. It was a big enough telescope to show people the galaxy pair M81 and M82 (and also the supernova!) During the constellation tour a bright meteor streaked past as we were looking towards Cassiopeia. Here are some images I captured at Ingram before and after my Jupiter talk. David and Olga were marvelous as usual, showing off the telescopes inside the hall. Outside with me was Tim, Ian and Shaun. I got a great view of M82 and the supernova through Tim's telescope and I glimpsed the shadow of Ganymede on Jupiter through Shaun's telescope. And when the cold was starting to bite....the bacon and sausage sarnie and coffee at Muddy Boots Cafe just around the corner really hit the spot! The only disappointing aspect of this event was the number of people cancelling last minute. I suppose when the rain was coming down in the afternoon it might not have looked good for stargazing. Even if that had been the case there would still have been a presentation, demonstrations of the telescopes and night sky (albeit a virtual one on screen). In any case....those non-attenders missed a cracking night under the stars. Next up is a stargazing event at the Tin Church in Low Newton on Tuesday night. One of the nearest supernovae in decades has appeared in nearby galaxy M82. It's been officially designated with the name SN2014J and I made a finder chart to show it's position below. It's very well placed for UK astronomers to observe and is almost overhead around midnight. I managed to get a picture of it last night through gaps in the cloud and it was easily visible to the eye through my 8 inch telescope. This supernova is a type 1a, meaning that it resulted from the catastrophic death of a white dwarf star. The host galaxy M82 is about 12 million light-years away. More to come soon! Stargazing Live is over for another year but NASTRO keeps going. Ian Glendinning, our Events guy, has added a lot of astronomy evenings in the next few months(in addition to our usual meetings). Bamburgh on Sat Mar 15th (100+ places). All the events are free but you should register at those links so we have a good idea of numbers attending. The format of the evening will be an astronomy presentation or telescope demonstrations followed by stargazing if the weather allows. Lots of NASTRO folk are bringing all kinds of telescopes to look through.